Brimful Curiosities: Earth hour - We participated, did you? All the lights were out in our house tonight and quiet reigned. 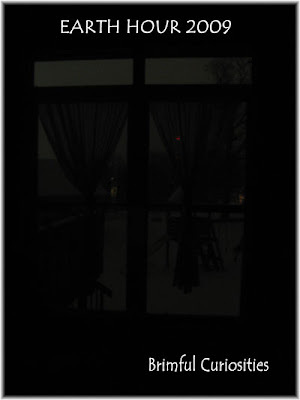 The spring snow fell briskly outside and we watched by the light of the street lights. From 8:30 - 9:30 p.m. this evening our family participated in Earth Hour 2009. We switched off our lights. Put the kids to bed. Sat in the darkness and talked. What a wonderful idea. Yep we did! Kids were in bed before it even began so me and Hubby had some together time.